A typical Filipino's memory of museums include boring field trips to museums emptied from buses and made to fall in line without making any noise. He's not being able to actually enjoy the experience but rather remember the experience as a requirement rather than a learning journey. It's sad that Museums in the Philippines are always empty, except students on field trips and a handful of foreigners, where visitors of the National Museum in one whole year can be matched by people at SM Megamall or SM Mall of Asia on a single day. A certified museum geek that he is, Tutubi painstakingly compiled this list of museums in the Philippines for all like-minded individuals wishing to discover their cultural and historical roots as well as curious tourists seeking to discover more the the Philippines of yore and get to to know heroes carved in stone, painted on various surfaces or preserved in various forms. This is in celebration of May 18 as International Museum Day declared by the International Council of Museums (ICOM). Note that this is a work in progress and will be updated once information is available. Should you know of other museums not listed here, do leave a comment and the information or links. Sourced mostly from Tutubi's knowledge of the place and/or news items with links provided below. How to get there: Located on Rizal Park (Luneta), it's just walking distance from LRT U.N. Avenue station or via jeepneys passing by Taft Avenue or Mabini. Directions to National Museum: from Makati, it's best to drive towards Roxas Boulevard then turn right on P. Burgos (after passing Rizal Park/Luneta). The museum in on the right, near the corner of Taft Avenue and across the National Art Gallery. Parking is available at the museum compound. How to get there: From Quezon City or Quiapo, better take jeepneys with signboards of Mabini and alight in front of the neo-classical building. How to get there: Board a jeepney in Quiapo with signboard Pier and alight in front of Palacio del Gobernador near Manila Cathedral. A short walk towards the gate of Fort Santiago with a minimal entrance fee. Address: Plaza San Luis Complex corner Gen. Luna & Real Streets. Remarks: Visit also Bangko Sentral ng Pilipinas Gold Room, a walk-in vault underneath the Metropolitan Museum with impressive collection of old paintings and ancient gold ornaments of pre-hispanic Filipinos. This is Tutubi's favorite museum, besides the National Museum. How to get there: Board the orange shuttle at LRT Vito Cruz station going to CCP Complex. Address: Manila Central Post Office compound. It is the oldest museum in southeast Asia. Allows the public to view the country’s rich repository of stamps and items used by the post office through the years including: Old mail boxes, typewriters, awards, paintings, stamps, philatelic magazines, as well as books and catalogues. How to there: Walking distance from MRT Ayala Avenue station. From LRT Buendia station, ride the bus with signboards Ayala/Rustans and drop off at Rustans (or Rufino Tower/PBCOM) then walk towards the museum with a fountain in front. significant Filipino artistic traditions and the CCP Collection of Traditional Asian Musical Instruments from the Philippines, Japan, Indonesia, India, Thailand, China and South Korea. open from Monday to Friday, 9:00 a.m. to 4:00 p.m.
How to go there: Board a jeep bound for Pier in Quiapo and alight in front of Manila Cathedral. How to get there: from MRT Ortigas Avenue station, it's just a short taxi ride away. Hidalgo (East side going to San Sebastian) then turn left on Barbosa St.
Gen. Emilio Aguinaldo’s uniform and hand-written letters of Apolinario Mabini. Entrance Fee: P20. Jet simulator fee between P75 and P150. How to get there: It's walking distance from MRT Quezon Avenue Station, near the jeepney terminal plying the EDSA -UP route. From Quiapo, you may ride jeepneys with Fairview / Lagro signboard. Museum is open Mondays to Fridays from 7 a.m. till 4 p.m., except during lunch time. Entrance fees are P75 for adults and P50 for students. What: Let children discover more about the environment, science, crafts, the global village, etc. via hands-on exhibits and interactive displays as well as enjoy featured activities like storytelling sessions. How to get there: Jeepneys in Quiapo with signboard Pier will take you there after passing by Intramuros and South Harbor gates. Alternatively, from LRT UN Avenue Station, walk towards Padre Faura St. and board jeepneys going to Pier, alight at the corner of South Drive, cross Roxas Boulevard towards the children's museum. How to get there: Jeepneys in Quiapo with signboard Pier will take you there. Get off in front of Manila Cathedral. Free - Every Wednesdays for UP students, alumni, faculty and employees for a group less than 10. Exhibits posters and dioramas depicting the Iglesia's beginnings, culture, rituals and practices. How to get there: From Quiapo or MRT Quezon Avenue station, hail a jeepney bound for Fairview and get off in front of the church. Remarks: the museum features the story of the atom, the varieties of life, the mystery inside the earth, the majesty of the universe and the evolution of technology. the museum’s main galleries on the ground level are called Atom, Life, Earth and Universe. Another gallery devoted entirely to Technology will be on the upper level. Honors the life and achievements of the National Living Artists Awardees of the Philippines (Gawad sa Manlilikha ng Bayan or Gamaba). Museum hours: Monday to Saturday from 9 a.m. to 7:30 p.m./Sundays 10 a.m. to 7 p.m. The museum would showcase the latest in railway technology for the appreciation of students and enthusiasts. There will also be a children’s center which offers creative, interactive and educational activities to increase visitors’ knowledge of the railway industry. 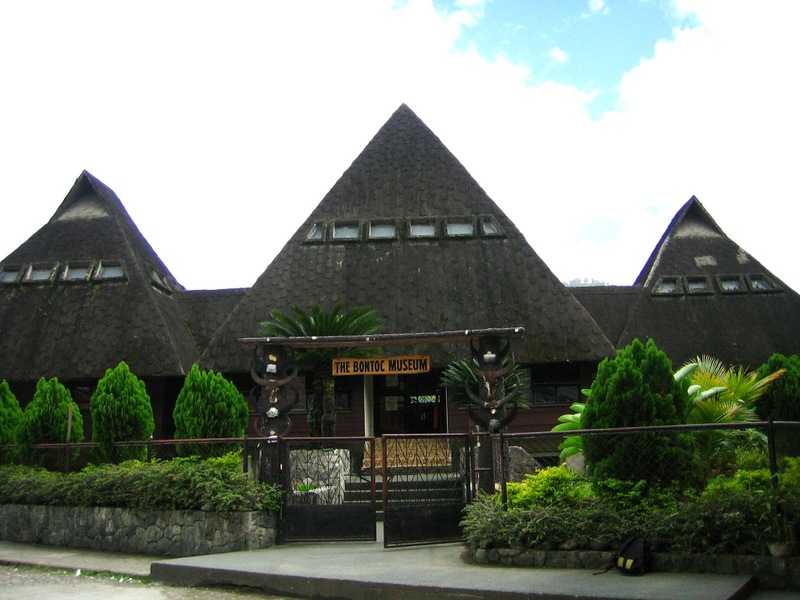 This museum is a good place to learn about the cultural heritage of the Cordilleras. Situated in a university building, the museum displays a range of relics and artifacts including an ancient coffin. A museum curator is always on hand to answer any questions and offer interesting snippets on information about the local culture. Phone: +63 74 442 3043. The Aguinaldo Museum is an interesting place to spend some time and sits beside the huge statue of General Emilio Aguinaldo, which also serves as an important Baguio landmark. The museum and statue are on General Luna road in an area of the city referred to locally as ‘Jungle Town’. A showcase of Cordillera's the mountain culture. The displays include a number of relics and artifacts showcasing local traditions. The museum buildings designed in the style of the mountain provinces. Provincial museum containing ethnographic materials relating to the indigenous people of Benguet. Kabayan Museum's attraction are the preserved mummies of Kabayan Mummy Caves said to be about 500 years old, one of the Philippines' national cultural treasures. It is a burial caves that holds mummies sited in Kabayan especially in the Timbac Caves. It also features the culture of the Ibaloi and the Kankanaey. Address: General Luna St., Laoag City. The Museo Ilocos Norte and Library serve as repositories of archival documents, books, artifacts, photographs, recordings and other aspects of Ilocos material culture. Former seat of the provincial government which houses Novo Viscayano history and heritage. Features a gallery exhibit & collection of antiques such as artifacts, fossils, ethnographic items, heirloom pieces, visual arts (photographs, paintings, sculpture, graphic arts); historical and cultural dioramas, miniature models of provincial landmarks, among others. 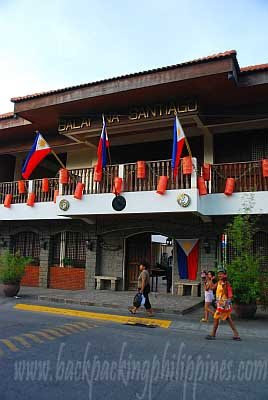 Originally built as the ‘Palasyo del Barrio’ or Barangay Hall of Calao West, Balay na Santiago is a reconstruction of a typical Spanish colonial house modeled after Gen. Emilio Aguinaldo’s house in Kawit, Cavite. It showcases historical artifacts relevant to the city plus interesting sites and traditions. Balay na Santiago looks like a reconstruction of a bahay na bato with the facade modeled after the Aguinaldo Mansion in Kawit, Cavite. Location: Residence of the noted Pampango artist, Dan H. Dizon, President of the Kamikaze Memorial Society of the Philippines (KAMESO). On display are World War II mementos, particularly those of Kamikaze pilots of Japan. Other interesting facets of the museum are the different helmets used by the Axis and Allied powers of World War II. Houses antiques and exquisite works of art depicting Pampanga’s rich cultural heritage. St. Peter’s Parochial Church (Apalit, Pampanga). Built between 1629 and 1630, it is located at the town plaza. Its ceiling and dome are filled with beautiful paintings. Academic Building of the MMLDC Foundation, Inc.
museum dedicated to rice and rice artifacts. plants can be seen in the hortorium near the bridge going up to Forestry campus. Features the different species of the insect world from the smallest bug to the biggest moth. The house in Maragondon, Cavite, where a military court tried Katipunan founder Andres Bonifacio and his brother Procopio, has been turned into a museum commemorating a significant, if dark, episode in our history. Its centerpiece is a life-size diorama recreating the trial scene. 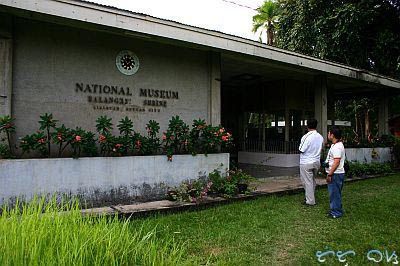 The museum houses a collection of the memorabilia of former president Manuel L. Quezon. A large section of the museum contains the personal belongings of the former prominent people of the province. showcases the history, culture, music, arts and crafts of Palawan that include artifacts from the Tabon caves. Monday to Friday except Wednesday. Address: Old City Hall Building, Rizal Avenue, Puerto Princesa City. Remarks: stradivarius violin, oldest books, century-old-pieces of furniture, wooden refrigerator, visual art collection, and hacienderos’ kitchen wares. showcases the history and artistry of the three major culture groups in Mindanao: the “lumad” (indigenous peoples), Moro and lowland migrants, particularly the Maranaos of Lanao (Ranaw), the Matigsalug, Higaunon and Tigwa Manobo tribes of Bukidnon, and the lowland Visayan migrants of Iligan and Cagayan de Oro cities. In any event, I'll try to see one of them when I visit home. One particular painting I would love to see is the Spolarium. Thanks Tutubi for this post. It's very informative. wow! I knew there are lots of museums in the Philippines, and I consider myself well traveled. I didn't know there are actually a lot I haven't been to in Manila even! Thanks for the list! I love you blog, by the way. Been following it for quite sometime. thanks for the museum listing! i now have a ready reference for those weekend getaways. We should keep the tradition of Bahay Na Bato, like Jose Rizals Bahay Na Bato in Calamba without that spanish garbage and be more like our neighbors in Asia, we’re not spanish we’re Asian!. All the museums are great and all the details are truly useful for the we tourist, we always think that all the great things are preserved there to see. Thank you so much for this list. I visited the Bahay Nakpil-Bautista on a school tour years ago, but some personal circumstances forced me to leave the tour early, and I was so sad to realize I couldn't remember the name or location of the house! You've helped me jog my memory. I hope they're open next week so I can go see it again on my trip to Manila.